After my thinking yesterday about If people, in the street, thinks about neutrinos, I realized that I have not talked about them and, that mistake, I have to remedy it right now. Neutrinos are some of the fundamental particles of nature, a type of fermion that, interestingly, have no charge. Come on, it’s one of your best quirks. Another of the star characteristics of neutrinos is that they are able to traverse matter “without touching” it, that is to say, they cross the atoms without any problem and very very few of them collide other fundamental particles existing in those atoms. That is, yesterday when I was wondering if people are worried or thinking about neutrinos I meant that they are going through them continuously. The birth of a neutrino (come on, its discovery) comes at the hands of Pauli and a curious fact with the linear momentum of atoms. And it is that, in physics, there are fundamental facts such as that energy is conserved (you know, neither created nor destroyed) so that if an atom disintegrated, energy should be constant and what you lose will win somehow. That form is the neutrinos. 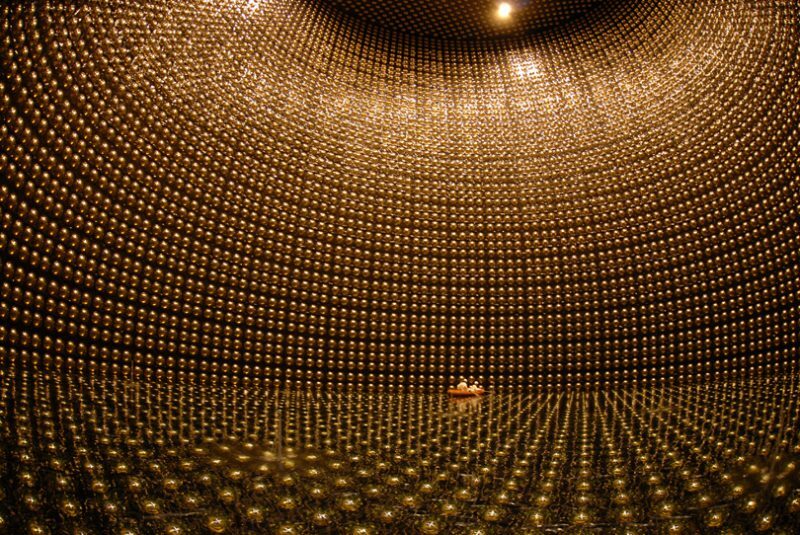 Unfortunately the neutrinos have so little mass that it makes them so elusive (less than a million times the mass of a hydrogen atom) and gives them their ability to pass through “everything” without colliding with anything. In fact, their quest is based on putting “very fat” atoms (with many elements, many electrons, neutrons and protons) that are very cohesive to see if, hopefully, some neutrino gives with something. And, if it happens to something, obviously, it would kick it out of the atom. So in experiments, we use liters and liters of water, waiting for a neutrino to collide with an atom of a molecule and cast the electron from the valence layer somewhere (some receiver) that lights up like a Christmas tree To be struck by the electron. Another feature, due to their weight, is that because they weigh so little, they are very fast. In fact they travel practically at the speed of light, which together with being very elusive, makes them ideal for knowing things that have happened a long time. That is, electromagnetic radiation, depending on its length is fairly easy to be absorbed by certain elements. So the visible light we see is because we absorb it or X-rays from the x-rays because the bones absorb them but other tissues let it pass, or the signal from our phones is able to pass through the walls… to a certain extent. Well, the neutrinos, thanks to how elusive they are, are spinning around our universe (which is isomorphic, then they can not get out of it) from the big bang. This makes them bearers of information from the very moment of creation of our universe and to detect them can safely give us valuable information about the densities or energies in the “beginning of time.” That is one of the reasons for its cosmologically speaking importance. Mathematically and physically there are three types of neutrinos, muonic, tautonic and electronic. The three types differ in their spin from their quark. The most interesting thing is that a neutrino can go from one “taste” (type) to another without any cost. This process has a name, neutrino oscillation, and is given when the same neutrino is measured in two moments where it may not necessarily have the same taste (type). This fact, because it happens, is unknown although it is known when it passes and it is when it passes through certain types of atoms, but that is just something that is being studied now. I hope that with this introduction (brief) you have aroused interest in this particle and, above all, you have seen the importance it has, at least, in cosmology.